Cream butter and sugar until fluffy, about 3 minutes. Add eggs one at a time. Sift flour, baking powder and salt, add coconut and lemon zest. Stir one third of flour mixture into butter, then stir in 1/2 of the milk, then an additional third of the flour, the remaining milk, and the last of the flour. This keeps everything nice and fluffy. Add the lemon juice at the end. Spoon into cupcake tins and bake, 11 minutes for mini cupcakes, 20 minutes for regular-sized cupcakes. Whip cream cheese and butter until frothy, add lemon and powdered sugar, whip some more. Add enough milk to thin the frosting a bit so it is spreadable. 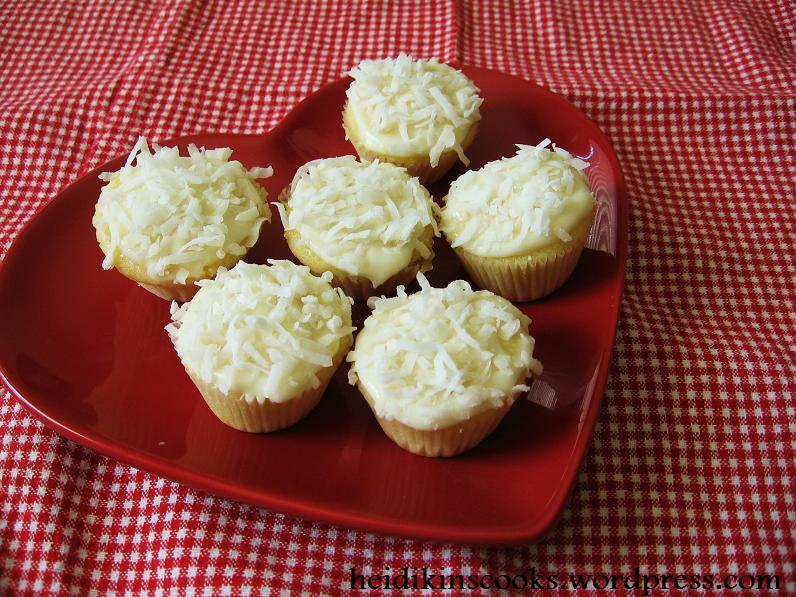 When cupcakes have cooled, spread generously with frosting and sprinkle with shredded coconut. Well, those look divine. Will be forced to make them the moment I return to my own kitchen.